Learn how breathing works: The Buteyko Breathing Clinic offers a health education programme of breathing exercises and lifestyle guidelines which corrects and alleviates breathing-related conditions including sleep apnoea, insomnia, snoring, asthma, emphysema (COPD), chronic bronchitis, sinusitis, hay fever, allergies, chronic nasal congestion, hypertension, chronic fatigue, hyperventilation syndrome (HVS), anxiety/panic attacks and many other breathing-related disorders. Benefits include better sleep, ability to cope with stress, improved fitness/ sports performance and less susceptibility to colds and flu. Correct breathing is also recognised as an essential factor in dental health. 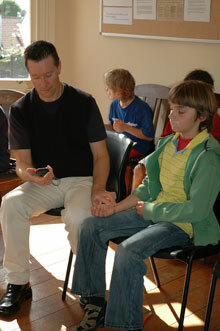 The Buteyko breathing technique can be learned by children as young as three and adults of any age.